The new fast optic from Olympus features an all-metal design and an equivalent focal length of 150mm - but how does it perform? Designed particularly with shooting portraits in mind, Olympus also says that the lens is ideal for shooting high-speed indoor sports. Like the 45mm f/1.8 lens, which was announced last year, it features an all-metal construction and a manual focusing ring around the centre of the lens barrel. Other than that, the design is very minimalistic, there are no switches for manual focus, that must be controlled from within the camera body. A reasonably expensive proposition for the time being, Olympus claims that the lens is capable of producing quick and silent autofocusing with beautiful out of focus areas. During our time with the lens hitched to an Olympus OM-D, we found these claims to be pretty accurate, but it's something we'd like to further investigate when a sample is made available for extensive testing. Both Olympus and Panasonic seem to quibble over which exactly has the fastest autofocus in the world, but with mere microseconds in it, needless to say that focusing is very quick. During our test, it locked onto the subject quickly and easily almost every time, only beginning to struggle slightly in low light. 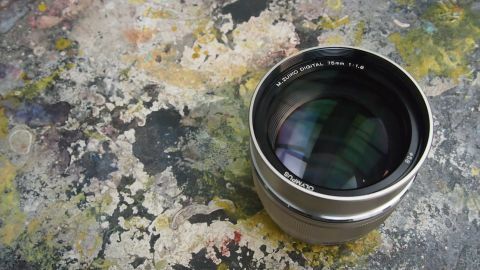 As the optic has a maximum aperture of f/1.8, the lens is very good for dark conditions, allowing for fast shutter speeds without having to increase sensitivity settings too high. That wide aperture also means that creative effects can be achieved when shooting wide open. Very shallow depth of field can be achieved, with out of focus areas being rendered smoothly. The drop off in focus is also pleasing and we can see this lens being very popular with those wanting to shoot portraits professionally. For ordinary users, it's likely that the focal length is a touch too long, as you need to be standing some distance away from the subject and close focusing isn't possible. It will be interesting to see how sales of the lens compare with the 45mm f/1.8 lens, which is perhaps more ideally suited to family and occasional portrait photographers.